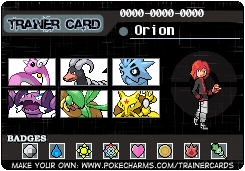 Orion made is way onto the shore, His Dragonair floating at his side. He had spotted the oddly bent trees in the distance and felt oped to explore. As he made his way through the grove, he made sure not to miss anything. His Dragonair cooed softly behind him. Letting Orion know of her unease. He brushed away a branch, with once hand, and with the other reaching for Dragonair's head to pat it soothingly. He had heard of the place, however, he wasn't told of what was inside. Soon, he entered the clearing. His red eyes widened in shock. 'A-A shine!' Orion stood frozen, gaping like a Magikarp. What could the shrine before? Who built it? The red eye's of his wondered to the cave that was positioned behind the shrine. He took a step forward, not to examine the shrine, but to take a look at the cave. The cave entrance itself was way too steep to trek on foot. One would slide down to what ever awaited them in the void. Looking to the side, Orion snatched up a smooth rock. It was a flat oval. Perfect for water skipping. It was grey at the top and bottom, long the edge was a lighter grey. Nothing too interesting. Soon an idea formed in the trainer's brain. He took out three objects. A little bit lengths way from Orin was a shadow, but the long flowing silver hair could easily be spotted, green eyes portraying a shy, hesitating shine. As the girl followed the red haired boy across the sandy white shore, the waves lapping on the ground gently, retreating silently before rushing back with a wind, repeating the cycle over and over again. The gentle beach breeze blew softly before blowing a bit stronger, lifting up the soft salmon skirt up front slightly as it reached the sun's light, a pure white pantie appearing as the skirt's color become a light sunset orange. When she'd noticed it, the girl kept herself quiet a bit, holding the skirt down, waiting for the wind to die down again before continuing. She had felt quite uncomfortable with the idea that she was sneaking and technically "spying" on him, and the idea of him catching her just made her even more skittish. Oh, who was this by the way? Obviously, from her actions and movements, as well as her emotions, it was easy to tell it was Anceril. It just wasn't like her to do something like this though. A new adult at the age of 18, beautiful luscious silver hair, ruby red and emerald green clothing matched with an obsidian belt and a few other nifty accessories, she was pretty attractive, wasn't she? At home, she was just the most popular girl that the guys always wanted to get to know. She had always felt uncomfortable around them, clumsy, nervous, and often stuttering. Though, they always thought it was just an act and just called her cute, as well as bothering her even more. A mob was often seen following her around the school. Enough of this, back to the main story. Anceril looked up, followed by Kurone and Cheryl, quietly trekking ahead on the cave floor before realizing that Orion was still outside, and could spot her easily. Spotting a large rock to shelter behind, she rushed behind, but, being the clutz she was, and her skittishness, the silver haired girl had tripped over and fallen on her knees. "Ahh...!" was the word that came out of her as she fell over, sound of splashes echoing around. Around her, the pool of water had started becoming cloaked by a crimson red that soon started to darken, combining with the water around it, forming a dark maroon shade. Sitting up, ignoring the fact that her clothes had become soaked, Anceril looked at her wounded knee, salt water in her eyes, making them blurry and hard to see with. She felt with her hands carefully before touching the large gash that went straight across her left knee diagonally. Her right elbow had a slight cut as well, and the rock that had cut across a side of her check was also bleeding. This was one of those times that she could prove to some that she wasn't the calm quiet girl she usually is seen as. She was just so nervous and seemed to be connected to Orion for some reason, that she just couldn't think of anything, but having him in her sights, which has been happening quite a bit recently. 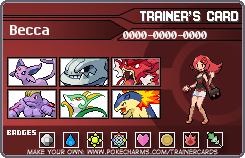 Unable to move from the stinging cuts, Anceril was aided by her Pokemon to attempt to stay hidden behind the rock, but the girl knew better to think that she could hide when it was obvious from the hints she left. ooc: Echou, he wasn't even in the caves yet. D: He was getting ready to go inside. Ic: Orion was just about to toss out his Pokeball, his hand lifted next to his head like he was going to throw it. Then the shriek came. The teen froze, eyes widening in shock. 'I thought I was the only one here!' Orion thought, turning slowly to where the shriek had echoed from. Narrowing his eyes he slowly approached the spot here he thought the cry had come from. However, what he saw, wasn't what he was expecting. Recently drawn blood spread through out the puddle, like an ink cloud from a squid, frightened. He frowned and glanced around, hoping the trainer could find him/her so he could help. Dragonair floated around carefully, using it's eyes to attempt to help her trainer. "Eh, Anceril, are you alright?" His red eyes looking over her wounds. Well, of course she wasn't alright, she was hurt. Without thinking, he tore part of the fabric off the helm of his white shirt, then leaped down, off the rock. Orion glanced at Anceril for her permission to bandage her wounds. Anceril curled up before Orion had gone in with his Dragonair, burrowing her head into her knees and arms wrapped around them, hoping that he wouldn't see her. Though, either way, she knew that wasn't going to happen. He'd know where she was. Well, from the traces of blood and her hair was blowing off to the side of the rock - it was too long. That was just a trait in the girls of her family - absolutely long hair. Not extraordinarily long, but long as in down to their knees or longer. Kanna's for example, is almost down to her ankle. How she keeps it tidy is a question, though it's obvious from the appearance that the blue hair was well cared for. Cheryl had floated up to the ceiling of the cave, however, was struggling around with some Zubat on the top, hanging around. Her appearance had disturbed them and the blue bats were now screeching angrily, flying around aimlessly, bumping into each other one by one before falling and then flailing away, soaring out of the entrance, past the shrine. The Whimsicott had a sweat drop, one eye twitched, mouth slightly in a smile as she let out a slight laugh. "Whimsi...Cott~?" Kurone on the other hand, had stayed right beside Anceril, while wishing she could've attacked, that was quite a bad idea. So, she had settled with playing with a shell on the shore. However, similar to the Whimsicott, the Glaceon wound up playing with a Shellder. It angrily let out a cry and continuously attacked the Eeveelution, before Kurone had shivered from pain. The Shellder quickly hopped out, following the Zubat. Anceril then heard the footsteps of Orion coming in, curling up closer in. However, it only take him a minute or two to find her. Burrowing in closer, wanting to ignore him, she shook her head to the thought. She couldn't do that - that would be just rude and... she did need to cover up the wounds or they'd get infected. This was one of the bad times she forgot to bring a first aid kit or anything. Looking up to the red haired teen, she looked down for a moment, wondering whether to accept or not. She could easily head back to Academy Island and just bandage them there. However, she couldn't just leave without an explanation - could she? Anceril blushed lightly before nodding slowly, accepting the offer. She was a bit curious as to how he'd handle this, considering one was right across a cheek. The other two, if she recalled, where on her right elbow and left knee. While she was uncomfortable with someone... touching her, she couldn't decline the offer. Anceril changed her position slightly, her legs now further out, but were still bent. Her arms were criss-crossed and the palms on her knees, despite the bleeding. While he bandaged her, she just looked away, hoping he wouldn't notice her embarrassment. Orion didn't look up until he finished bandaging her knee and elbow. He was careful not to tie it too tightly, for it would have suffocated her arm. Then they would have something else to worry about besides a few cuts. Though, Orion was also careful not to tie it too loose. Then the bandaging would have fallen off, and it wouldn't have stopped the bleeding. So he was hopeful that it wasn't too wrong. Hehe I felt like I was writing Goldilocks. Only when he looked up, did he notice her embarrassment. What was she embarrassed about? That she fell? Oh, better avoid that subject. "Is the bandaging fine?" He asked carefully. Looking up at her face, he noticed that a smaller cut bled slowly. A tiny ruby colored drop gathering at the edge. Honestly, he didn't know what to do about that. Slightly confused, he picked up an extra patch of his now torn shirt, and balled it up as if one was about to blow their nose in it. He leaned forward and dabbed the drop, then quickly took a step back. Feeling embarrassed himself, for well, ya know. Out of habit, he scratched the back of his head. It was a habit he had also, sadly, given to his sister.